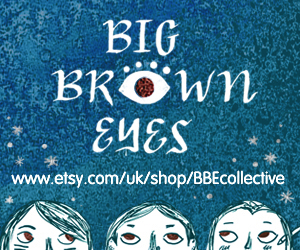 BROKEN FRONTIER AWARDS – BEST WRITER, BEST ARTIST AND BEST ONGOING SERIES NOMINEES! This DC relaunch of Peter Milligan’s Shade the Changing Man from Gerard Way’s Young Animal imprint – itself a reboot of Shade creator Steve Ditko’s original 1970s run – divided and conquered last year, winning much ardent admiration and some confusion from its readers. 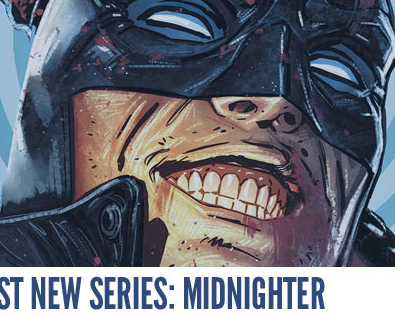 In previous incarnations Shade has ranged from straight up super-hero universe dude to total batpoo crazy, page and narrative-bending, body-borrowing, interdimensional poet. He’s also been a she when during the Vertigo run the title became Shade the Changing Woman for a while. Technically those were all the same actual character though, whereas current alien protagonist Loma/Megan is not. Loma uses Rac Shade’s madness coat to transport her consciousness to Earth and inhabit the body of comatose teenage archetypal mean girl Megan. As the powers of the madness coat and the echoes in the beautiful bully’s brain baffle Loma’s arrogant and naïve attempts to fit in on Earth, her erstwhile boyfriend back on Planet Meta tries to hide her comatose body from his colleagues and the authorities. 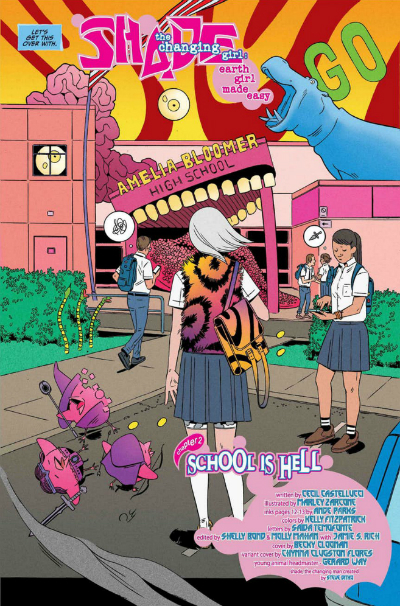 While possibly not entirely original, the visual and emotional extremes in this take on the tropes of high-school-as-hell in issues #1-6 of the comic (collected in Vol. 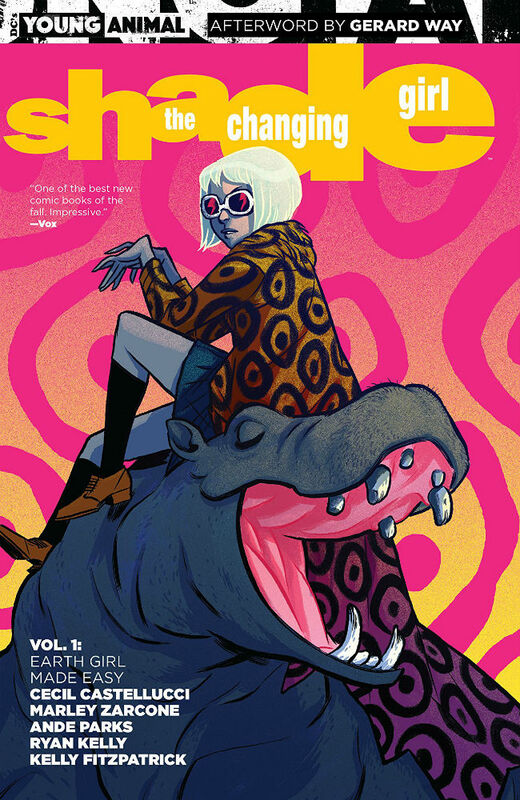 1: Earth Girl Made Easy) are enjoyably pulpy, whilst our heroine’s utterly left-field take on everything (coming literally from another planet) makes for a funny, twisted outsider perspective on it all. Jocks, nerds, field trips, lab partners, supernatural powers, bullies, outsiders with hearts of gold, oblivious parents blithely grounding their kids who are up to much more than they guess… you know the drill. While the teen melodrama is Pretty Little Liars levels of dark, writer Cecil Castellucci balances the pettiness and visceral angst perfectly with a canny awareness of the absurdity and impotence of adolescent life. 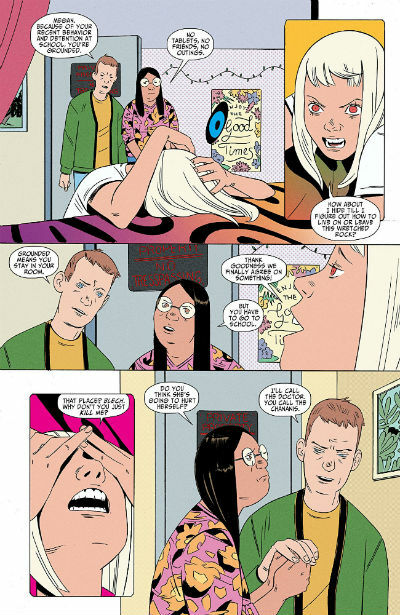 Zarcone (artist), Parks and Kelly (inkers) and Fitzpatrick (colourist) do a really bang-up job of mixing the old wobbly bullseye rainbow leopard print motif about the panels but there’s a lot more to the art here than a few distorted circles. The fades and patterns are firmly psychedelic without feeling dated, and light touches of neon metaphor peek around the corners of the narrative. Wherever Shade/Loma/Megan goes, trippy visuals follow, sometimes subtle, sometimes full-on bug infestation, giant reaching hands, purple hippos and rainbow bubbles. The madness is a powerful force. Also the dog is really cute. I think it’s a corgi. Of course. All the best comics have synchronised swimming, didn’t you know that was a thing? Probably because it’s way more fun to draw than the regular kind of swimming where you just race. And it’s great if your lithe disembodied bright pink spectral form is a former aquatic dancer for when she’s flying through the air wreaking havoc, it’s just more plausible that she would make those elegant poses. Also the team has all of the minorities: black, Asian, ginger and short. Teacup must be a really good swimmer for them to let her on the team, ‘cos you’d feel like the height difference would mess up the symmetry. Published by DC’s Young Animal imprint, Shade the Changing Girl, the second TP collection Vol. 2: Little Runaway comes out Wednesday, January 31, 2018. Read about the 2017 Broken Frontier Awards here.